At Mary Rose a sense of home and a sense of place are about more than hiring a designer or buying a set of furniture. It is not about more, more, more, or newer, newer, newer, newer. At Mary Rose, filling a home is about honoring craftsmanship and honing one’s sense for what type of place best allows you to thrive, relax, be inspired, and enjoy life’s blessings. To me, this means a home filled to the brim with antiques, handcrafted goods, art, color, reminders of friends and family, and plenty of materials for projects. For others, it is more about neutrals and a few favorite pieces. I have started my own daughter company for fun, called Daisy Mae, and in it I join others in the movement to repurpose, reuse, reconstruct, and recycle. I use discarded fabric, old clothes, and vintage trims. These words, repurposed and reconstructed, are words that a new generation recognizes, but the movement has roots in antiques. It just feels good to sit in an old rocking chair, and rock at the pace that people have been rocking in that chair for decades. The one pace that the chair seems to know. I think it is more than just the beauty of handcrafted solid wood. I think it is in honoring the time and patience that first went into making the chair and then into preserving it. Throwing it out would be a slap in the face. Finding an antique chair in a particleboard heap is joy. Giving it its proper place in the living room is justice. It feels good to reuse. It feels good to make do. It feels good to use up. Mary Rose also carries new products, almost all of which are handcrafted and most of which are of superb artistic quality. We believe these will be the next generation’s true treasures. We hope that we can be part of your journey to find beauty in your home and surroundings, whether it be inspiring you to dig grandma’s old platter out of the attic, or to buy one that reminds you of hers, or to lead you to fall in love with a new piece of pottery. We think that you will be inspired by mingling between our collections of old and new at Mary Rose. And when you are ready to create your own masterpiece, we hope we can be there too with studio classes. The 1215 Warford building which houses Mary Rose was built as a telephone operators’ building, complete with hurricane shutters, concrete floors two feet thick, and beautiful windows. Before becoming Mary Rose, it was a law office and a church. In those years it was modernized, as were most old buildings. Dropped ceilings were introduced along with layer upon layer of paint. It is fitting that the building housing my mom and her collection of antiques, art, and collectibles would be one that she restored since my mom’s primary love is for transformations and her primary gift is to see the beauty and goodness in all. Part of taking on the project meant believing in our family, since Mom knew she couldn’t restore a building on her own. My dad and brothers, Chris and Ben, are all carpenters, and they worked tirelessly, first on the demolition and then on the restoration. 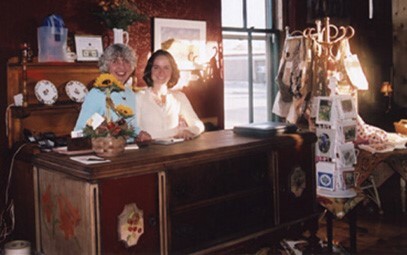 My husband, Eric, and I helped for weeks at a time, as well, and I was able to spend nearly two months at the shop during the summer of 2006, helping the building reclaim its original glory, as well as navigating the logistics of an emerging business. Since deciding to begin Mary Rose, Mom has been able to embrace all her artistic, decorating, renovating, and antiquing urges. With a house nearly bursting at the seams, it was not a moment too soon. Instead of rotating between projects at the kitchen table and being burdened with daily clean up, Mom now has multiple studios with plenty of natural light and room to spread out. Another thrill of this project for my Mom has been the ability to call on the talents of old and new friends and family. Whether it be artistic or sewing talents or a knack for antiquing, Mom has been able to give friends a place to showcase their abilities. Mom hopes local artists will use her shop as a showcase for their work as well, and is always eager to see antiques that someone would like to sell. We hope you are able to visit our store soon, and look forward to seeing you. Mary Rose, an art gallery and antique shop at 1215 Warford in Perry, Iowa, combines the old with the new. Old photos of telephone operators at their switchboards greet visitors in the entryway of the former telephone company built in 1913 and renovated last summer by my family. Removing two dropped ceilings and hauling away nine tons of rubble in a grain truck, we exposed the open rafters and the full eight-foot height of the twelve windows. We stripped the woodwork, laid a wide plank pine floor, and gave the walls fresh coats of paint. Mary Rose opened November 4, 2006. After retiring from teaching school for 31 ½ years, I now enjoy two studios which are filled with natural light and provide space to paint, create stained glass, and sew, as well as hold classes. Light also streams into the main gallery of Mary Rose where art and antiques intermingle with handcrafted items, and local/area artists display their work. I look forward to seeing you at Mary Rose Collection!